A basket of ultimate scrumptious treats for your sweetheart or for the both of you to enjoy. We've filled this lovely keepsake wicker basket with eighteen scrumptious assorted mini muffins two 2 ounce assorted muffins, two jars of premium jellies, one packet of premium cocoa, one packet of gourmet coffee, and four packets of Earl Grey Tea, as well as a 4 inch decorated heart shaped, frosted butter cookie.. The basket can be enjoyed well after all the scrumptious goodies are gone. A perfect way to celebrate any special occasion. Of course, all muffins are individually wrapped for the ultimate in freshness. Includes a free gift card. 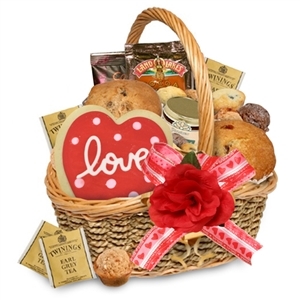 A basket of ultimate scrumptious treats for your sweetheart or for the both of you to enjoy. We've filled this lovely keepsake wicker basket with eighteen scrumptious assorted mini muffins two 2 ounce assorted muffins, two jars of premium jellies, one 8 cup packet of Starbucks cocoa, one 8 cup packet of starbucks coffee, and four packets of Earl Grey Tea, as well as a 4 inch decorated heart shaped, frosted butter cookie.. The basket can be enjoyed well after all the scrumptious goodies are gone. A perfect way to celebrate any special occasion. Of course, all muffins are individually wrapped for the ultimate in freshness. Includes a free gift card.